Description: Instantly have a delicious creamy dish with a hint of Parmesan flavor that is simple and quick to make. 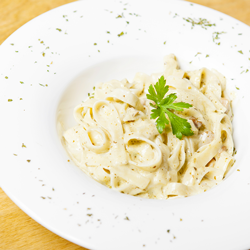 There are few dishes richer and creamier than Pasta Alfredo. Now you can have that rich, creamy goodness in just ten minutes. It doesn’t get much better, or easier than this. This sauce is commonly served on pasta, but don't limit it to noodles. It also turns steamed vegetables into something rather sumptuous. Instructions: In a small sauce pan, melt margarine over medium heat, add Alfredo Sauce Mix stirring vigorously with a fork while adding the non-dairy creamer. Simmer until thickened -- about two minutes. Serve over your favorite pasta and or vegetables. *The amount of non-dairy creamer can be adjusted depending on desired creaminess. Storage: Store in a cool, dark place with lid tightly closed. Ingredients: Potato starch, modified corn starch, whey, salt, wheat flour, yeast extract, natural flavor, maltodextrin, parsley. Contains milk and wheat. From Anonymous of Oviedo, Florida on 9/7/2009 . Sprinkle over cooked pasta, baked potatoes or steamed veggies.